The construction of The Sibson Building, the new academic home for Kent Business School on the Canterbury campus, is nearing completion. 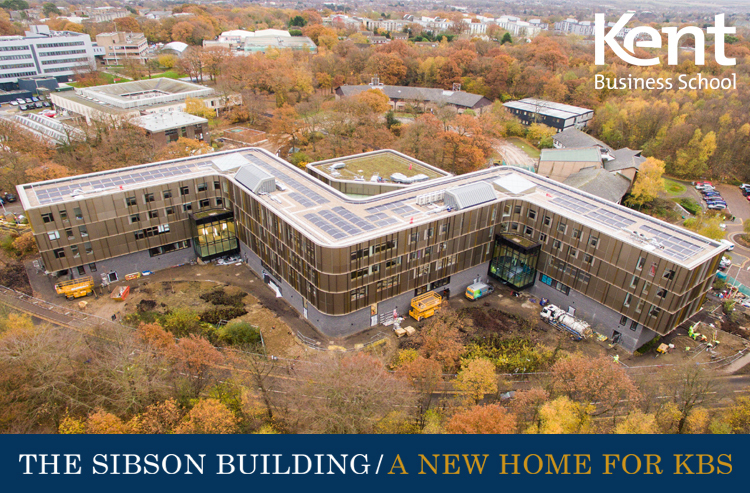 Named after the University of Kent’s third Vice-Chancellor, Professor Robin Sibson, the state-of-the-art building with new teaching and learning spaces and modern social and breakout areas will encapsulate KBS academic values and identity. KBS, alongside the School of Maths, Statistics and Actuarial Sciences (SMSAS), will be moving into the new Sibson Building in March 2017, with timetabled lectures and seminars beginning with the new student intake in September. We are excited to share with you this aerial footage, shot in November 2016, which showcases the unique architecture and harmonious integration into the campus landscape.